Jayvee Casio is proving that if you're a true baller, height doesn't matter. He was the focal point of the Smart Gilas' offense last night in their win against Al jala'a Syria. The final score was 85-80. To shock some of you, this win is a come from behind one. Smart Gilas struggled to score in the first 3 quarters and they were down by 15 points in the start of the 3rd quarter but Jayvee Casio suddenly got his rhythm as he scored 22 big points including 9 gorgeous assists to Marcus Douthit for the easy dunks and dumps. Because of Casio's timely passes under duress, Douthit was able to score 24 points, 12 rebounds and 3 blocks. From then on, Gilas never looked back up to the final buzzer. Marcus Douthit had to score a lot in this game because he was against a former NBA player and a former Laker, Samaki Walker. Douthit had to score a lot or else Walker will beat him. Douthit and Walker went head to head in this game, but Douthit was the victor in this game because his team won. Walker had 25 points in this game, 16 points coming in the first half and only 7 points coming in the second half. He played like an NBA veteran. I a bit satisfied on his performance. No wonder he was a reserve player in L.A.. The Syrian Team lost in this game because of foul trouble. They could have won the game but their ace players went into foul trouble. Micheal Madanly receive his 4th personal foul with 6 minutes remaining in the very early 3rd quarter. Marcelle Yaqqub, the big man of Syria, on the other hand was ejected after receiving his 5th foul with just 3 minutes remaining in the 3rd quarter. Chris Tiu of Smart Gilas took advantage of the absence of those two players. He made a 3-pointer to tie the game in the 3rd quarter. 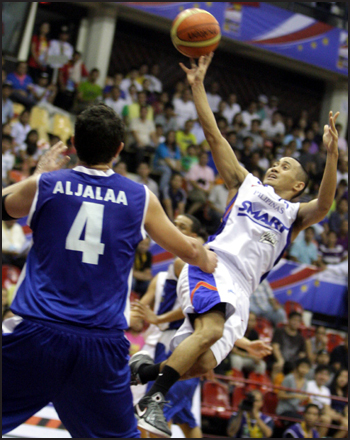 In the start of the 4th quarter, Japhet Aguila made a 3-point play that gave the lead to Smart Gilas. That was their first taste of the lead after 3 quarters. The Smart Gilas never looked back since then. They have maintained their lead enroute to winning the game. Smart Gilas advances to the semi-finals and they will face Iran on Saturday. I hope they'll win against a very tall and athletic Iranians. Samaki Walker is not just any other NBA player. He was part of the draft class of '96. Considered to be the 2nd greatest rookie class ever. He was even darfted higher than Kobe bryant and Steve Nash. Part of that draft class includes former PBA imports Jason Sasser(Pop Cola/ Swift) and Ron Riley(Alaska). Aside from being a former Laker He was part of Spurs' first ever title in '99. Prior to that he started his career with the Mavs. Nice comment. :) I agree with this post. Nice one ballerspinas.com!